To summarize: Traveling causes you to lose weight and grow! My best selling book will be out shortly. 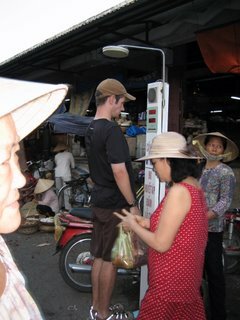 An review of our time in Saigon/HCMC soon. In the meantime we're in Hoi An exploring the old town, enjoying the much cooler weather and recovering from our 17 hour train ride while simultaneously preparing for our 16 hour one in a few days time to Hanoi. Good times abound as China looms in the horizon. More soon. Remember your blog audience includes an engineer! Thanks for bursting the bubble grimes...I was ready to pack my bags and head on out to hopefully grow to a respectable height! But alas, I see, that Brian did in fact cheat with his hat ahd shoes (bad Brian).